House of Maths School Workshops Primary & Secondary in Dorset & South - HOW MOST PEOPLE CAN BE “BETTER THAN AVERAGE”! Jane’s statement seem ridiculous – how can most people be better than average? Using some mathematical trickery, here’s how she could be logically correct. Monday’s mean = (1+2+…+9+10)/10 = 5.5. Unsurprisingly, half the class were better and half the class worse than average. Tuesday’s mean = (1+1+1+1+1+1+2+2+5+9)/10 = 2.4. Jane came equal third but still did worse than average! Wednesday’s mean = (1+5+8+9+10+10+10+10+10+10)/10 = 7.9. Despite coming third from bottom, Jane can still tell her father that she did better than average! So how is all this possible? 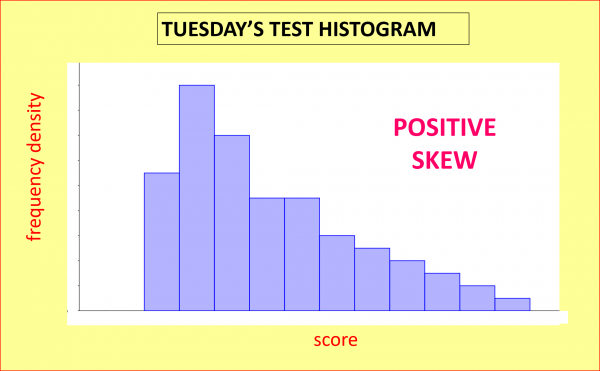 The problem here is that the data for Tuesday and Wednesday are both very skewed: positive skew on Tuesday and negative skew on Wednesday. 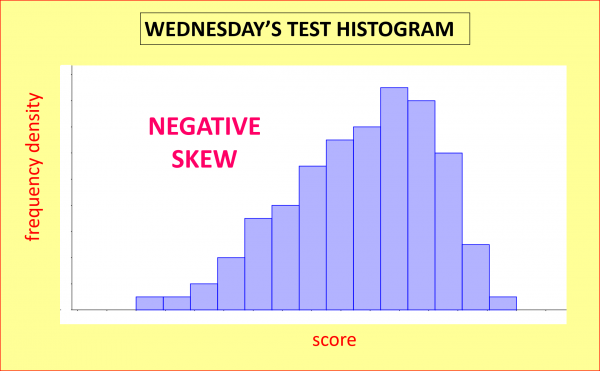 MEAN VERSUS MEDIAN: for skewed data like the tests for Tuesday and Wednesday, the best average to go for is the median rather than the mean. 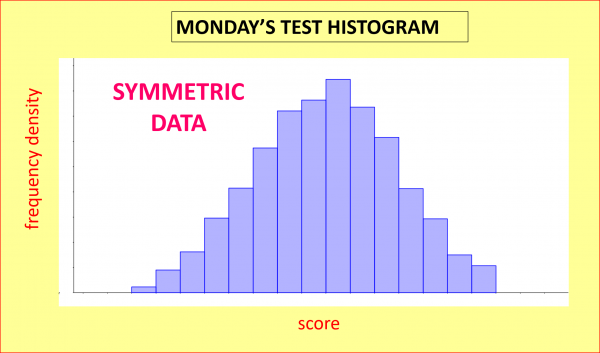 To calculate the median, just put all the data points in numerical order and choose the middle one. In this way you can be assured that half the values will be smaller than (or exactly equal to) average, and the other half will be bigger than (or equal to) average. ADULT WAGES: a great example of positive skewness is adult wages: according to www.gov.uk the median average wage before tax in the UK in the 2015-2016 tax year was £23,200, but a small number of ultra-high earners distorts the mean, increasing the mean “average wage” to £33,400: a whopping 44% higher than the median. For this reason, the media commonly reports the median rather than the mean wage. You can imagine how depressing it would be if the mean was reported: in 2015-16 for instance, 71% of us earned less than the mean wage (the 71st percentile was £32,900). HOW MANY LEGS? : most humans have 2 legs, but the small number of humans with fewer than 2 legs brings the mean average number of legs to just under 2, meaning that most humans have more legs than average – but only if you use the mean rather than the median. Another example of negative skew is birthweights of newborn children: in this case, the small number of babies born prematurely means that most newborns weigh more than average (again the apparent paradox is resolved if we use median rather than mean). SUMMARY: Prime Minister Benjamin Disraeli is supposed to have once uttered the famous quotation: “There are three kinds of lies: lies, damned lies, and statistics.” Leaving aside whether he ever said these words, we can see now how statistics can produce counter-intuitive results such as Jane’s but with a clear conscience.